Landscape photography is one of the most varied forms of photography, in that it incorporates perhaps the greatest range of techniques. From slow shutters to capture running water to making use of the rule of thirds to “mathematically” create the most pleasing scene, landscape photography has it all. Many of the topics imperative to creating the best landscape photos have been covered elsewhere in this website where they may provide more depth. In this section, we will provide at least one example of major considerations when lining up for the perfect landscape shot, along with links to each respective page where you can delve into even more detail. The most important consideration with landscapes is that it stands out. 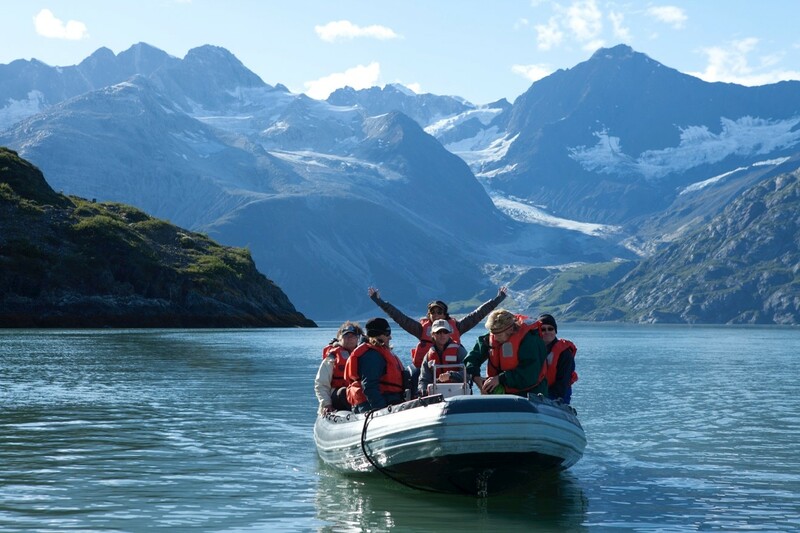 Because most landscape shots don’t require fancy camera equipment or big zoom lenses, they are accessible to everyone. Thus, it can be difficult to have your photo stand out from the masses. Beach scenes, sunsets, open savannas, are beautiful in their own right, and when in an exotic locale it’s hard to take a bad shot. But, this website is not about taking shots that aren’t bad – it’s about taking GREAT shots, and learning to make them better with every trip. 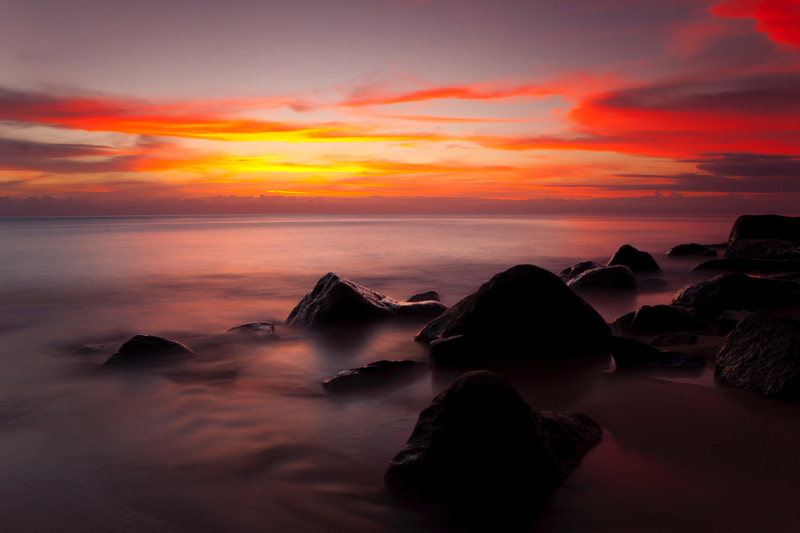 The first thing you must do when ready to take a shot of a beautiful landscape shot is to slow down and look. This might be obvious to look at the shot you’re taking, but it’s critical to take advantage of any nuance in the scene before you. Sure it’s a great beach with crystal clear water, or an endless expanse of evocative tropical jungle. However, what else can you squeeze into the scene? Is there an interesting piece of driftwood lying in the sand, or perhaps a cluster of colorful leaves on a nearby tree in the jungle. On a beautiful night in Madagascar the sunset on the Indian Ocean was just sublime. 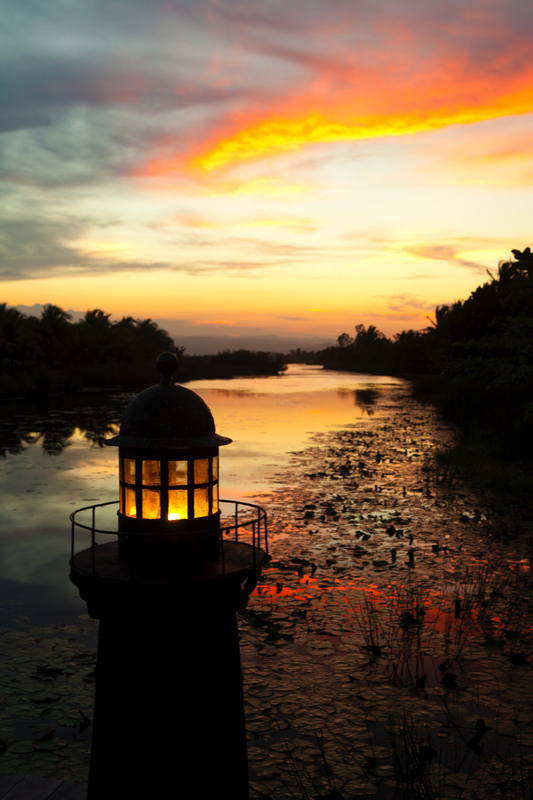 However, in order to make this photo “pop”, a small boardwalk lamp was framed in such a way that the color of the light is wonderfully complementary to the sunset and reflection in the water. The sunset is no less beautiful with the lamp in it, and it provides a bit of intrigue in the shot. 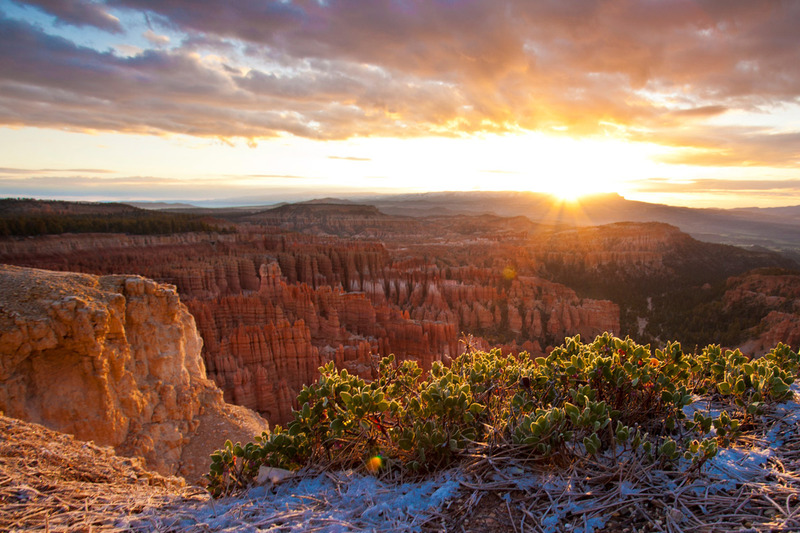 When in areas of overwhelming beauty and color, it’s easy to forget to stop and look around. 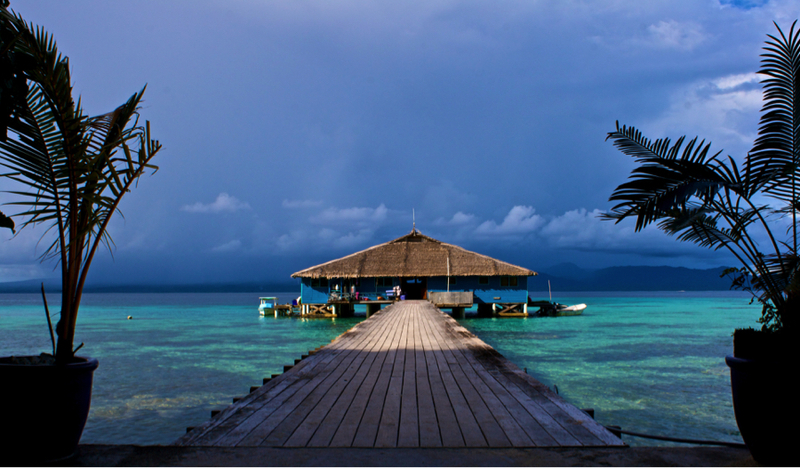 Would a photo of this restaurant in the Solomon Islands still be beautiful without the silhouetted palms? Of course, look at that amazing water, reef, and color of the clouds! However, when stopping for a second to really analyze the scene, one can find additional features to improve a gorgeous scene even further. 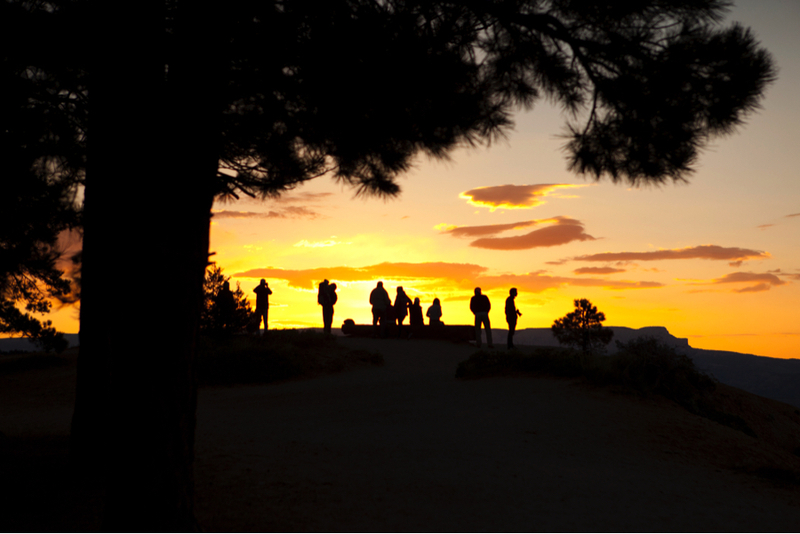 The above photo is a great segue into the next topic – framing your landscape shots. By looking for interesting elements and “leading lines” that direct the viewers eyes into the shot, your landscape photo will go from good to great. 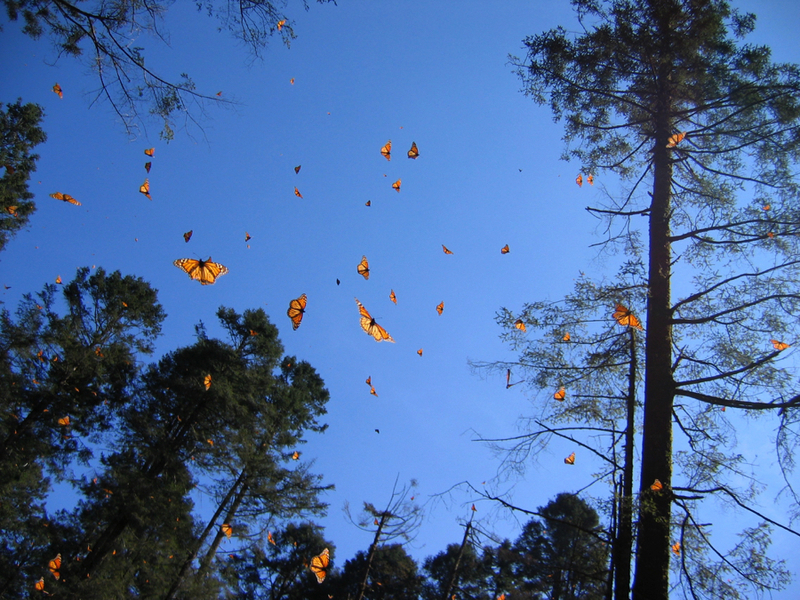 At mid-day in Sierra Chincua, Mexico, during the monarch butterfly overwintering event each year, butterflies burst from the trees in an amazing display of orange and black. Against a blue bird sky, the colors are incredible and the scene is quite moving. In a way, the zooming butterflies is a beautiful display of chaos. However, to create a bit of order to a scene like this tends to be pleasing to the eye. In the above photo, large fir trees border the photo, drawing the eye into the center of the shot where well-focused and vibrant monarchs are in perfect view. The frame of your photo can be virtually anything you find that provides shape and contrast to the photo. While trees provide a wonderful frame for many shots found in nature, rock formations work very well, too, as in the first of the above photos. 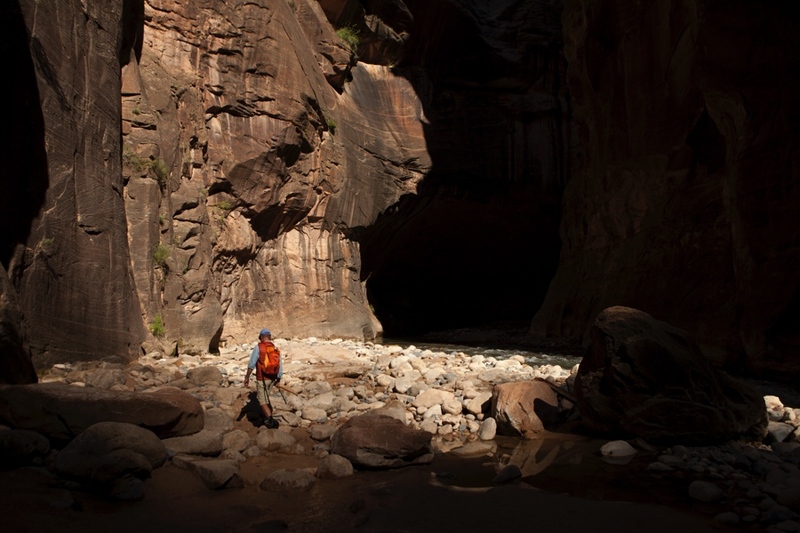 Even intangible things like shadows can frame a shot, which served this photo well when attempting to portray the massive and mysterious “narrows” of Zion National Park in Utah. While it’s often critical to employ rules of composition in your landscape shots to make the most of them, it’s also critical to add gusto to these shots. In addition to using natural features to “frame” your shot, including a foreground element is also a valuable tool. 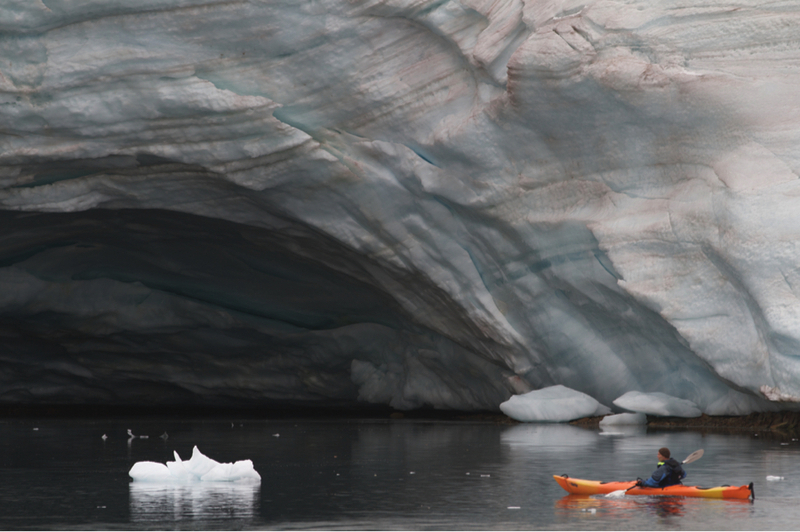 Foreground elements can come in a variety of shapes and sizes, from rocks in the tidewaters of the beach to a kayaker paddling through icebergs in Antarctica. In fact, one could say that the foreground element becomes the actual subject of the shot, drawing the eye towards it with the landscape in the background just that – in the background. The truth is that for many people that were not with you when viewing a landscape, it can look quite flat with no appreciation for the scale or context of it. Adding something in the foreground solves this dilemma by providing context and scale in a remarkable way. One of the most powerful tools to provide context and scale, especially with photography while traveling is the human element. It can seem counterproductive to take a lovely shot of a natural landscape, the beauty of which lies in the pristine remoteness it exudes onto the viewer, only to put a human right smack dab in the frame. 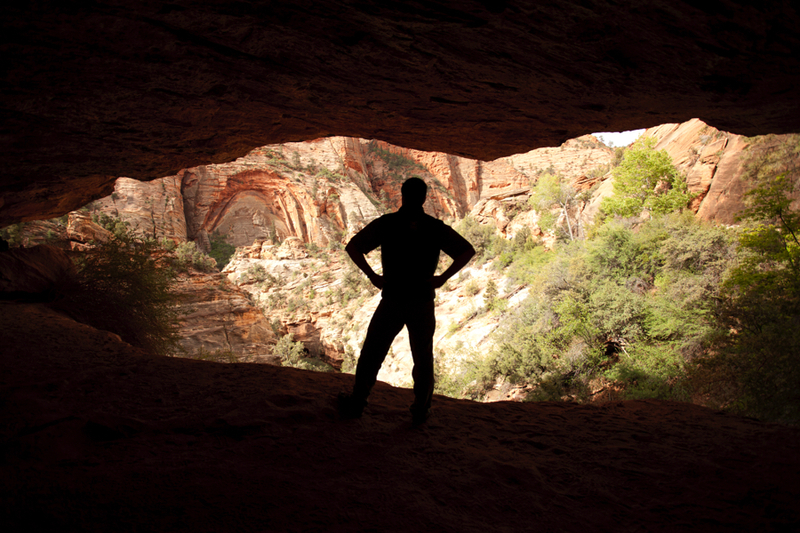 Who wants to look at have a person in their wilderness shot? Well, it’s not always the solution to creating a more dynamic shot, but sometimes it can indeed have wonderful effects. The power that the human element has is that it allows the viewer to imagine themselves there in your scene. And voila, the photo becomes that much more revered because of the relationship the view instantly has with your photo. Humans are one of the best ways to show scale in a photo. While animals, plants, rocks, and other foreground elements work well, too, the human size and form is much more relatable such that the viewer can instantly appreciate the relative size of the surroundings much better. 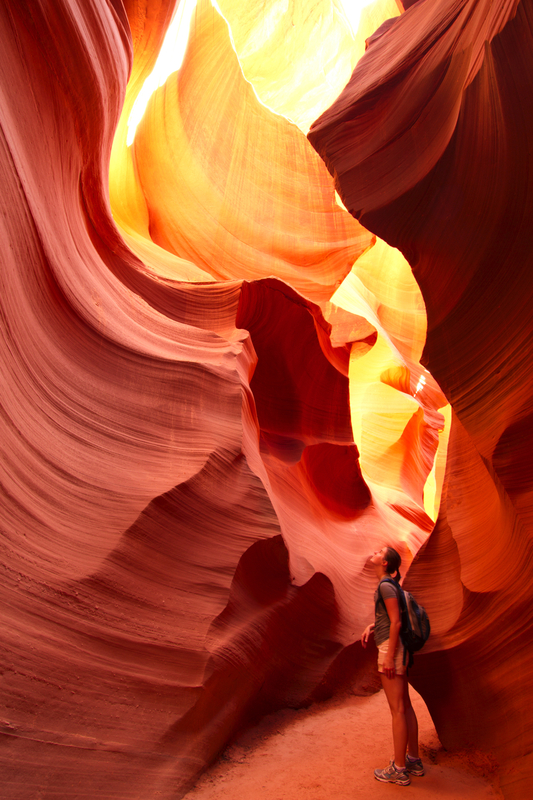 In the case of the above photo, the girl in the shot gives a clear indication to the size of this slot canyon. And as an added bonus, it allows the viewer to relate to her and imagine themselves in that canyon, awed by its austere beauty just as she is. Landscapes are some of the easiest things to photograph, yet as a style of photography one of the most difficult to master. To take your photos from good to show-stopping, it’s critical to add more to the landscapes that sweep you off your feet. By adding creative elements of composition, context, scale, and even storytelling by adding the human element, you can make landscape shots multidimensional and endlessly evocative. Through a few simple considerations, you will be well on your way to mastering one of the more venerable forms of photography out there. Employ traditional composition rules, while keeping your eye out for outside the box creativity. Consider adding elements to the photograph beyond the landscape itself, especially elements in the foreground. Take your shots to the next level by adding complexity and scale, to provide context to the scene you’re shooting.